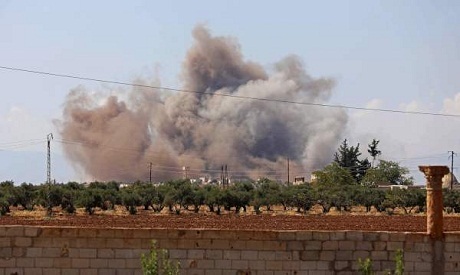 Russian and Syrian jets resumed intensive strikes in Idlib and Hama on Sunday, residents and rescuers said, as Damascus stepped up its assault on the rebels' last major stronghold after a Russian-Iranian-Turkish summit failed to agree a ceasefire. They said Syrian army helicopters dropped barrel bombs - typically filled with high explosives and shrapnel - on al-Habeet and Abdin villages in southern Idlib and a string of other hamlets and villages in the area. The Syrian army denies using barrel bombs. However, United Nations investigators have extensively documented their use by the army. Damascus, backed by allies Russia and Iran, has been preparing a major assault to recover Idlib and adjacent areas of the northwest. The province is Syria's last major stronghold of active opposition to the rule of President Bashar al-Assad. Russian and Syrian warplanes have resumed their bombing campaign a day after a summit of the presidents of Turkey, Iran and Russia on Friday failed to agree on a ceasefire that would forestall the offensive. Turkey and Western powers have warned of a bloodbath if a major Russian-backed bombing campaign is launched in the heavily populated northwestern province that borders Turkey. The United Nations also said it feared a full-scale offensive could cause a humanitarian catastrophe involving tens of thousands of civilians. So far the aerial strikes have not hit a major city in the province where over three million civilians, many displaced from other areas, have found refuge in the course of the conflict. Russia says it avoids civilians and only targets radical al Qaeda-inspired groups but opposition sources and residents say most of the casualties in the last few days were civilians. The opposition accuse Russia and its allies of striking at hospitals and civil defence centres to force rebels to surrender in a repeat of earlier, large-scale military offensives. A U.S.-based medical charity that operates in the provinces said three hospitals and two civil defence centres were bombed in the last two days, "leaving thousands with no access to medical care". "It is distressing to see a rise in attacks on medical facilities...There are over three million civilians in this crowded area of Syria who are in a life-threatening situation," Ghanem Tayara, head of Union of Medical Care and Relief Organisations (UOSSM) said in a statement.